“Complex Cities – Managing Urban Challenges” is perhaps the greatest challenge of our times and of future as well. So, any productive activity or brainstorming around it is a great contribution. 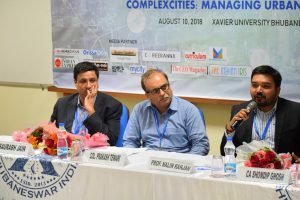 And that is exactly, what Samavesh 2018, the first Business Conclave of the year by the Students Association of Xavier Centre for Urban Management and Governance, Xavier University Bhubaneswar (XUB) at the Xavier City campus on August 10 was all about. Attended by the enthusiastic and eager-to-learn batch of future urban managers, the business conclave was conducted in three sessions; each with varied sub-theme, with industry veterans addressing the same. Among those who attended were experts from both core industry and the industries ancillary to the urban sector, along with the reputed faculty members of XUB, including Prof. Kajri Misra (Dean, Xavier School of Rural Management), Fr. E. A. Augustine, S.J. (Registrar, XUB), Dr. Fr. Paul Fernandes, S.J. (Vice Chancellor &Director, XUB), Mr. Susanta Sharma (Head-Global Alliance, Smart Cities, TATA Projects), Mr. Kiran Kumar (Deputy General Manager, Smart Cities and Safe Cities, L&T), Mr. Vikas Chandra (Advisor, Deloitte), Mr. Kamlesh Yagnik (Chief Resilience Officer, 100 Resilient Cities, Surat), Mr. Ashish Khare (General Manager and Global Head, Smart Cities and IoT, Wipro), Ms. Annie Phillip (Lead – compliance and regulatory policy, Saahas Zero Waste), Mr. Sai Vidya Sagar Manthina (Vice President, Fluent Grid Ltd.), Mr. Rajesh Jain (HR Head, SREI), Mr. Saurabh Jain (Business Advisory Head, Feedback Infra), Col. Prakash Tewari (Executive Director, CSR DLF), CA Shomdip Ghosh (Finance, Accounting and Institutional Reforms Specialist, Darashaw) and Mr. RipuBhamjan Singh (Monitoring and Evaluation – Knowledge Management Specialist, Deloitte). 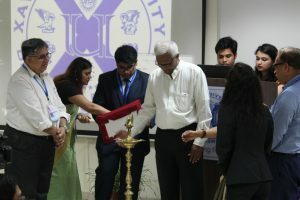 The conclave started by lighting of the ceremonial lamp, followed by inaugural addresses delivered by Prof. Kajri Misra, Dr. Fr. Paul Fernandes, S.J. and Fr. E. A. Augustine, S.J., who briefly delineated how the theme is important and should be widely discussed. They further elucidated how students of urban management and governance can contribute and learn the industry scenario from the experts addressing today. They also highlighted how the new venture of urban management and governance came into inception, and how the industry has responded in the most positive way by appreciating the college for pioneering the course. The first session began on a high note with Prof. Tathagata Chatterjee moderating with panel consisting of five industry experts. Mr. Susanta Sharma discussed about the importance of governance quoting “Governance is said to be successful, when the benefit reaches the poorest of the poor”. Stating the importance of smart governance, he highlighted the need for citizen participation, and employment being the key of development. Topics regarding Smart transportation systems like ATCS (Adaptive Traffic Control System) and ITMS (Interim Traffic Management System) were briefly conferred. Mr. Kiran Kumar from L&T was the next panellist, questioning the audience on the readiness of infrastructure, followed by a briefing on Smart Cities, E-Governance and command-control base.He also focussed on artificial intelligence, video analytics and face recognition; further questioning how secure we are digitally, protection of data and data collection. Next up from the panel was Mr. Vikas Chandra, who started his presentation with a video showcasing varied projects taken up and executed by the government, like the Kanha Riverfront Development, Bhopal Public Bike Sharing, Social Equity Centre, Pune Smart Roads, etc. in varied cities.He also explained how we have come a long way from“reluctant urbanisers” to making “urban-centric plans”. Mr. Kamlesh Yagnik, engaged the audience with resilient city features and how resilience and ‘smart’ go hand in hand. He focused on the city of Surat, where he is the Chief Resilience Officer, explaining how different factors are used to measure a city Liveability Index and compared different cities to highlight how each city is different, and how the challenges faced by each of them varies. Mr. Ashish Khare took the dais quoting “We created cities, scarcity of clean water, violence and crime, Yet, who do people blame?”. 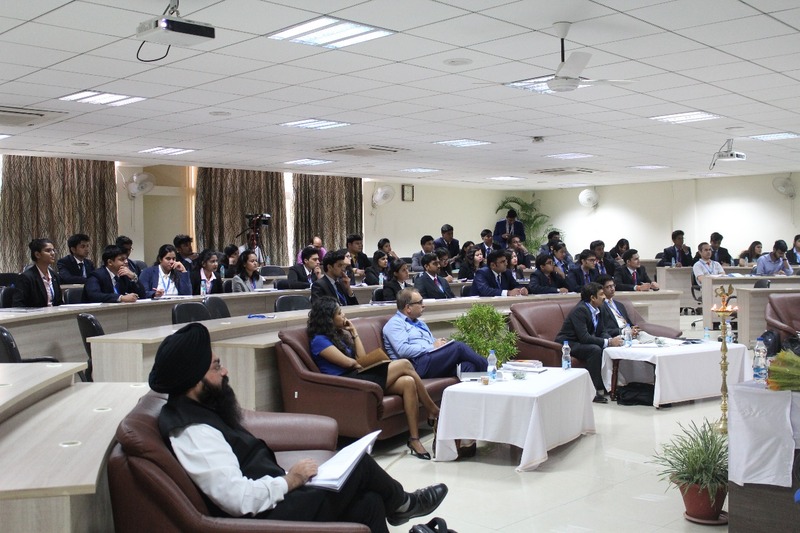 The second session began with bustling energy from the previous session with Prof. Mayank Dubey as the moderator. Ms. Annie Philip majorly focused on solid waste management; providing varied ways to start catering to this major issue from the very basic level, which is our households. She also shed light on the informal and formal workers and various firms catering to this specific problem and handling it at the grassroot level. Mr. Manthina took a very interactive approach, showcasing opportunities in urbanization with two hundred odd fields being connected to urban. Accentuating the transport facilities, including the roads, and comparing it to the conditions in previous years, he elucidated on how they have improved tremendously due to the Golden Corridor. Last on this panel was Mr. Rajesh Jain, with an extensive experience across different domains,within the industry. He stressed on the virtuous cycle of growth and the importance of proper infrastructure at the same time. He highlighted how difficult it is to fund risky projects, talking about times when they come to a standstill. The third session started with moderator, Prof. Nalin Ranjan, briefing the audience about Non – metro cities. Mr. Saurabh Jain emphasized the challenges of urban development in non-metro cities while comparing two of the largest urban cities, Delhi NCR and Mumbai; and how only municipality is covered under smart city out of the four. The drastic increase in population and factors of migration like the push and pull factors were the focus of his presentation. Col. Prakash Tewari was an engaging speaker, interacting with the students with every new topic. He catered to the informative session on Public-Private Partnership mode in Gurgaon, along with how it has grown through the years, with the challenges it faces. The second last speaker for the day was Mr. Shomdip Ghosh who stressed on water supply projects and lack of urban local body level reforms. Last to take the dais was Mr. RipuBhamjan Singh, who emphasized on the resource generation from reusable sources of energy, which is available in abundance like the solar power, wind etc. The session was concluded with an insightful question and answer round with the experts; followed by Ms. Manisha Choraria, the Coordinator of HabituX, giving the vote of thanks to all the experts and the faculty.